It’s never a good day when you lose your car to a distracted driver that tries to flee the scene of the accident. What makes losing a vehicle to a distracted driver even worse for William Smith is that the car had been in his family for 45 years. According to The Drive, Smith’s father had owned the 1931 Ford Model A since 1973 when it was gifted to him when he turned 16. Smith says that his father drove the car to high school and college. When the younger Smith turned 18, his father gifted the car to him, and he drove the car to college and work. Countless amounts of money, time, and effort were put into the car over the years says Smith. The car was also a labor of love for the father and son duo as it had laid in pieces since the early 1990s when it was torn down for a full restoration, the car had only been hauled out of storage for the duo to finish a few years ago, and was completed six months prior to the accident. The younger Smith says that he was at work when he heard the crash and wandered over to see what happened, and came upon the devastating scene. 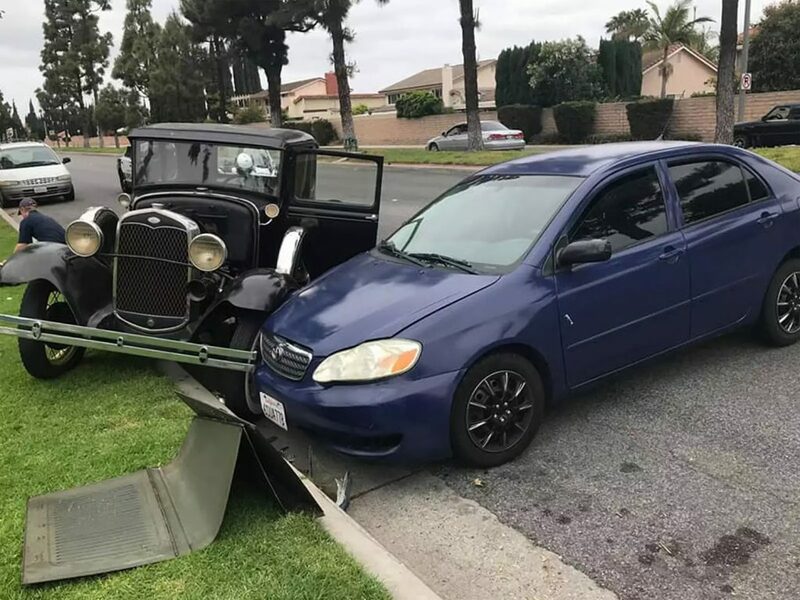 The Corolla driver had hit the 1931 Ford Model A so hard in the rear corner that the car was shoved onto the sidewalk. The massive impact bent the frame and driveshaft, split the engine block, snapped all four wire wheels, broke the differential, and sent the hood flying into the grass. Smith notes that the entire structure of the car is buckled; essentially the car is totaled. Neither of the Smiths is happy about what happened, but the silver lining, according to the elder Smith, is that they get to rebuild the car together again. As for the distracted driver, she tried to flee the scene of the accident, but younger Smith says he stepped behind the car to keep her from escaping. As it turned out her Corolla was stuck in the spokes of a destroyed wire wheel. When unable to flee the scene in her car, the woman left on foot only to be apprehended about 20 minutes later by police in a nearby neighborhood. The woman is alleged to have admitted she was on her phone at the time of the accident. 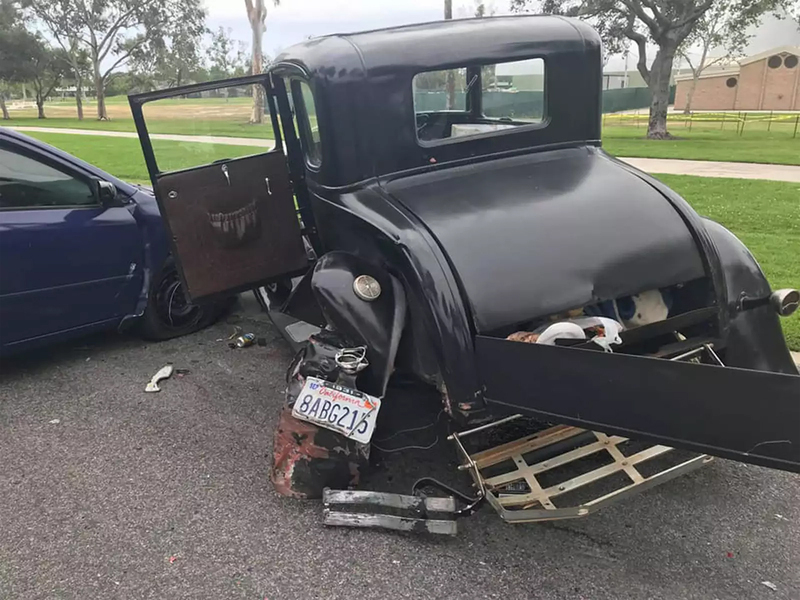 Smith plans to use as much of the beloved 1931 Ford Model A that has been in his family for over four decades as possible and build another car. The father and son duo are currently looking for a frame to start the rebuilding process. If you are wondering what the build process for a Model A is like, Hagerty built one over four days back in 2016. The Modesto Area A’s is hosting the big Turlock California swap meet January 26th and 27th . Good place to find a frame. TEEN WOMAN DRIVER STRIKES AGAIN! ANd people say Saudi Arabia or The Handmaid’s Tale are bad models for society!